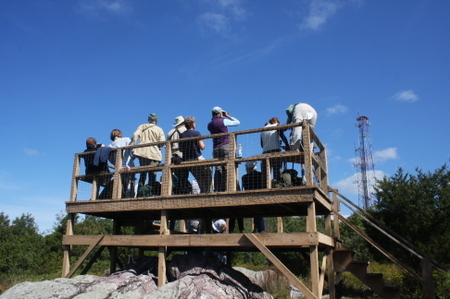 My latest column for The Record and Herald News is on my three favorite local hawk lookouts -- Montclair, Mount Peter, and State Line -- and why I love hawk-watching so much. Marsh Warden Mike Limatola and I are doing our first-Saturday-of-the-month walks again this fall -- on Sept. 8 and Oct. 6 at 8 a.m. The September walk will be followed by an optional half-hour tour of the historic Fell House nearby. E-mail Jim Wright here to rsvp or get more info. Check this blog, celeryfarm.net, for updates, last-minute weather advisories for the walk, and directions to the Celery Farm, Green Way and the Fell House. We hope to see you on Sept. 8. Listing follows. Bergen SWAN is sponsoring a guided paddle of Lake Tappan Reservoir and beyond, led by naturalist Nancy Slowik, on Sunday, Sept. 9, from 3 to 6 p.m. The paddle launches from a ramp at the southern end of the reservoir. After a safety and paddle technique introduction from an Eastern Mountain Sports veteran kayaker, we will travel north through what is known as the 40 Foot Hole and then further north through the bewildering lovely Spatterdock Marsh. Nancy will provide insights into the flora and fauna and seasonally changing landscapes of these unique sections of the Upper Hackensack River Watershed. Full info, including cost and kayak availability, is here. Mount Peter Hawk Watch News! I'm very pleased to announce that the Mount Peter Hawk Watch now has 54 years of data in Hawkcount. Many Fyke members, especially in the 1950's, '60's, and '70's contributed time and effort to the count, and their data will now be available to researchers and the public. Denise Farrell & I worked a good part of the summer entering data, and I couldn't have kept up the tedious work without her. Our Mount Peter Clean-Up date is set for Sunday, September 2, 2012 at 9 a.m. If you can help out for a few hours or just an hour, we'd appreciate your help. We pick up garbage and cut brush & small trees. Bring work gloves, loppers, saws, anything you think might be of use. If you can make it, please let me know. Don Torino wrote a great column on Celery Farm Warden Mike Limatola on the wildnewjersey.tv blog. "Sometimes there are people that choose to make the world a better place. They could just as well have been virtuous and noble neighbors, good citizens, and parents that worked hard and left it at that. But sometimes there are those who find it in themselves to step up to give more. "They make a decision that they would work to protect the environment around them and create a better community for all of us. With little or no fanfare, they work hard each day to ensure that wild places stay that way. "Making sure our birds and butterflies are safe and they strive to provide the opportunity for people like you and me to get out and enjoy these places. "One of those rare individuals is Mike Limatola, President of Fyke Nature Association and Marsh Warden of the beautiful Celery Farm Nature Preserve in Allendale ..."